Fort George is a large 18th century fortress near Ardersier, to the north-east of Inverness. It was built to pacify the Scottish Highlands in the aftermath of the jacobite rising of 1745. The fortification is based on a star design, it remains virtually unaltered and nowadays is open to visitors with exhibits and recreations showing use at different periods, while still serving as army barracks. 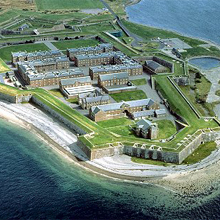 Fort George is managed by Historic Scotland, please check the website to see when the facility is open to the public and the charges that apply.